If you are a regular reader of this blog, at some point you would have read about the concept of coevolutionary arms races between hosts and parasites (see this for example). 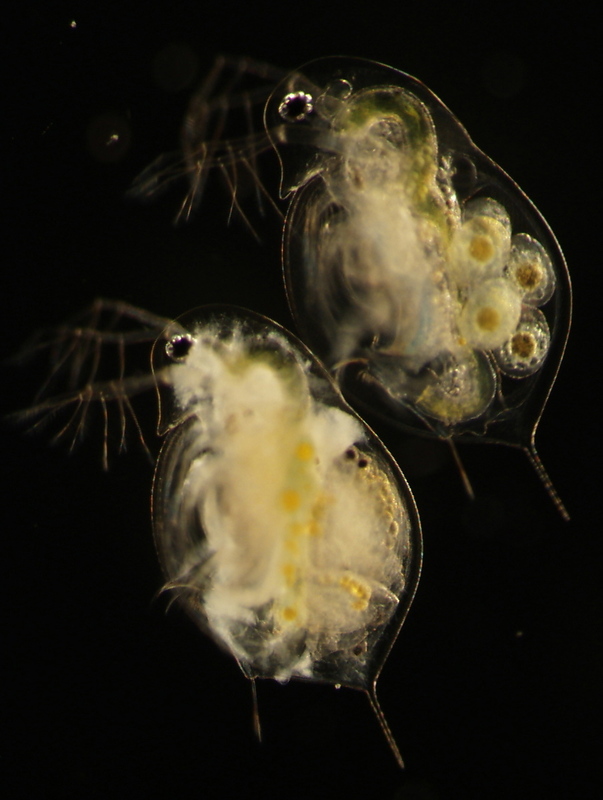 Previously, we have featured Pasteuria ramosa - a bacterial parasite of the waterflea Daphnia. Pasteuria ramosa is very picky about its host - specific strains are compatible only with specific host genetic lines, and as we have talked about in that previous post, this parasite is very harmful. Because of how virulent P. ramosa is to waterfleas and because the resistance by the host is dependent upon being the lucky genotype that is not compatible with whatever strain of the parasite which is most common at the time, this sets up an ideal situation for a Red Queen-style evolutionary arms race (and it is one that has been going on for long time). But in some areas where P. ramosa is found, it also co-occurs with a different parasite - the one that we are featuring today: Metschnikowia bicuspidata. It is a yeast that also infects Daphnia (other fungal parasites also named Metschnikowia biscuspidata have been reported to cause disease in shrimps, crabs, even fish - but it is more likely that they are similar-looking fungi that have been lumped together). The study we are looking at today was conducted by a collaborative group of three researchers who wanted to find out what happens when waterfleas are confronted by both parasites. Under such circumstances, will the presence of M. bicuspidata exacerbate the existing arms race between Daphnia and P. ramosa, or will it simply get in the way? If resistance for P. ramosa is also associated with resistance to M. bicuspidata, then it means Daphnia has a general mechanism for resisting both parasites. This scenario will simply select for general parasite resistance in the Daphnia population, reducing the level of genetic variation in the population (the raw material for ongoing Red Queen-style evolutionary arms race). On another hand, if Daphnia resistant to P. ramosa are negatively associated with resistance to M. bicuspidata, then it means resistance for one parasite will come at the cost to another - this trade-off in defending against two different parasites sets up an additional selective pressure that can potentially accelerate the arms race. There are a number of key differences between the two parasites. While P. ramosa reduces the reproductive capacity of the host more than M. bicuspidata, the latter kills the host quicker. Metschnikowia bicuspidata is extremely lethal, killing infected waterfleas within 2-3 weeks of infection (whereas waterfleas can live up to 5-7 weeks after being infected by P. ramosa). The fungus releases its spores after the waterflea dies, and those infective spores can even survive passage through a fish's gut if their host Daphnia is eaten. And unlike P. ramosa, infection success of M. bicuspidata depends not so much on encountering a host with the right genes, but through sheer persistence - the more often a waterflea is exposed to M. bicuspidata spores, the more likely that they become infected. This difference also manifests in the nature of outbreaks caused by the two parasites. Outbreaks of P. ramosa tend to be rarer and more limited, especially in genetically diverse populations, whereas M. biscuspidata is more prone to massive outbreaks that spread widely across the whole population. Even though it is not as discriminate about host genotype as P. ramosa, it is not as if M. bicuspidata does not influence the evolution of its host. But the way it affects host evolution is different to that of P. ramosa - instead of selecting for specific genotypes, it influences how much the waterfleas allocate their resources into either reproduction or parasite resistance. In this study, the researchers found that different genetic lines of waterfleas varied considerably in their resistance to M. bicuspidata, but a waterflea's resistance to the fungal parasite did not in turn predict how well it also resisted P. ramosa. Instead, as found in previous studies, infection success of different P. ramosa strains depended upon the specific combination of host genotype and parasite genotype. This indicates that waterfleas have very different ways of resisting the two parasites, and that resistance to one does not lend protection to the other, but at the same time, nor does protection against one parasite increases a waterflea's vulnerability to the other. Therefore, as far as the Red Queen arms race between waterfleas and P.ramosa is concerned, even though M. bicuspidata looms as a significant threat to the waterflea population, it is unlikely to significantly alter the coevolutionary dynamics between Daphnia and P. ramosa. We have previously featured a number of coccidian parasites on this blog from birds (here and here), alligators, and groundhogs. Today's coccidian parasite lives in a strange ant-eating, egg-laying mammal from Australia - the short-beaked echidna Tachyglossus aculeatus. The parasite we are featuring today is found in the gut of the echidna where it resides alongside another species of Eimeria - E. tachyglossi. Both these coccidians are found exclusively in echidna guts (generally coccidians are highly host-specific), and both are known to cause mild to severe inflammation of the small intestine, and in some cases, associated with fatality in systemic infections where the parasites have spread to the echidna's other organs. However, the exact role they might play in disease is still unclear. The study we are featuring today was conducted to establish the baseline, background level of Eimeria infection found in healthy echidnas. Most newborn mammals become infected with coccidia within their first week or month of life. In contrast, juvenile echidnas that have not been weaned were found to be free of coccidia. Given that echidnas become infected with E. echidnae through exposure to oocysts while feeding on ants, and young echidnas do not start feeding on ants until they are weaned at 6 months old, this age-dependent diet shift most likely explains the absence of E. echidnae infection in juvenile echidnas. Marine leeches are commonly known to feed on various vertebrate hosts - mainly fish and sea turtles. However, today's parasite stands out from the pack by associating itself with an arthropod. Instead of fish or turtles, Mysidobdella californiensis sticks its sucker onto mysid shrimps. Mysids are also known as opossum shrimps because the females have a little brood pouch (called a marsupium) in which they carry developing young. The discovery of Mysidobdella californiensis actually occurred rather serendipitously. Back in the summer and fall of 2010, an unprecedentedly huge swarm of mysid shrimp appeared off the central Californian coast. Some of those shrimps got sucked into the water clarification system at the Bodega Marine Laboratory. With all this shrimp in the system, the lab staff began collecting them opportunistically for fish food. But then, they started noticing these little leeches attached to the shrimps, so they made a concerted effort to collect the shrimps directly from the water clarifier, and examine them under the microscope. What they found were tiny leeches about 1.5 cm (a bit above half an inch) long. Approximately one in every six shrimp were found to have leeches on them, and each infected shrimp was carrying between one to three leeches. Seeing as this is a new species, at this stage very little is known about its biology except what can be inferred based on what we know of a related species - M. borealis - which has been studied in slightly more details. It is unclear whether M. californiensis (and related species) merely hitch-hike on the shrimp and use it to carry them to potential hosts, or if they in fact feed on the shrimp. In laboratory trials on M. borealis, the leeches refused to feed on any of the fishes that they were presented with, and none of the leeches were found to have fish blood cells in their gut. It is possible that Mysidobdella as a genus specialise in feeding on mysid shrimps. If that is indeed the case, then Mysidobdella would be the only marine leech known to feed on the blood of invertebrates rather than vertebrates. However, mysid blood has yet to be found in the gut of these leeches, so at least at this point, the diet of M. californiensis remains a mystery. Burreson, E.M., Kim, B. and Passarelli, J.K. (2012) A New Species of Mysidobdella (Hirudinida: Piscicolidae) from Mysids along the California Coast. Journal of Parasitology 98: 341-343. Sunday morning started off with the Associate Editor's symposium, a fairly new feature of the ASP meetings where 3 of the associate editors of the Journal of Parasitology give talks about their own research. Ramon Carreno began and talked about his work on the pinworms of arthropods - people went crazy over these beautiful worms (I know, we're weird folk). Ash Bullard then showed us the results of his recent work following up on the effects of the Deepwater Horizon oil "spill" on parasite fauna. For most types of parasites, there wasn't a significant difference, but for a few, oiled sites had more and for a few others, oiled sites had less. The symposium concluded with my AMNH colleague, Mark Siddall, up on a soapbox about doing 'omics studies of parasites and asking folks to collaborate to get more genomes and transcriptomes of parasites as they represent a lot of phyla that we don't have reference genomes for. Armand Kuris later gave his presidential address, this time talking about humans as parasites and describing patterns across the globe. I headed to the taxonomy and systematics talks for the afternoon, which included the one given by my grad student, Bryan Falk. 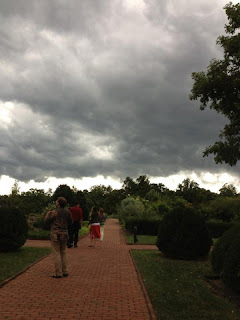 That evening, we had our banquet at the Lewis Ginter Botanical Garden. Though the clouds were horribly menacing, soon we were all eating and drinking merrily. As the desserts rolled out, there was suddenly a toast -- er, a roast! -- of Jerry Esch, our out-going editor. The meeting wrapped up on Monday with another session of taxonomy and systematics for me, including several talks by folks from Gerardo Pérez-Ponce de Leon's lab from UNAM who I met while visiting last fall and then my talk, where I talked about a way to eradicate Plasmodium falciparum - taxonomically, that is. Posters were presented over lunch and then we headed into our business meeting. Lihua Xiao of CDC recapped his childhood in China and how it prompted him to have an interest in parasitology and then, as an introduction to Bill Font's acceptance of the Mentor Award, Charles Criscione and Michelle Steinauer did a little skit comparing him to Yoda - complete with voices. Looking forward to seeing everyone in beautiful Quebec City in 2013. If you're interested in joining the American Society of Parasitologists, click here.